This is an ideal burner for custom installations where a dramatic pattern flame is desired. Extra large 600mm wide, 6 Litre stainless steel ethanol burner with twin flame pattern. The VBXL6 is an extra large capacity 6 litre, 600mm wide stainless steel ethanol burner suitable for custom fireplace design installation. 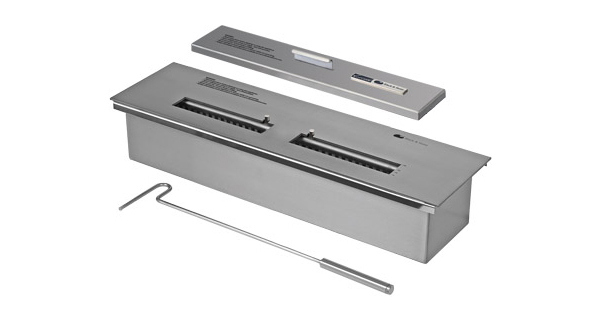 This burner is designed to be used in any non combustible surround or enclosure. This is an ideal burner for custom installations where a dramatic, wide pattern flame is desired. VioFlame custom series burners must be installed according to the instructions and guidelines supplied. Burners must be installed in a non combustible base and enclosure and are required to be installed with particular attention to heat and ventilation clearances. We strongly recommend you do not commence installation preparations, or create a cutout for the burner until you have purchased the burner and checked its dimensions against your plans. *Recommended maximum heating area does not apply to outdoor installations. Minimum room size and ventilation requirements apply to all models. Please read the full installation and owner’s manual supplied with your fireplace before installing or operating.